Anti-lock Braking System is a very common feature, you can get this feature in many cars and bikes, The Anti-lock Braking System is very important for safety. The meaning of Anti-lock Braking System is itself in the name, this system avoids tire lock when we suddenly applied brakes. Basically when you apply brakes in a critical situation or when your speed is high, the changes of tire getting skid is very high so you may lose your control over the vehicle and it may lead to an accident. In this situation, sliding friction is always greater than rolling friction. Anti-lock Braking System works intelligently in this scenarios. In this system, sensors present near the wheels recognize the dis-accelerate rate and control the brakes. It applied brakes at a particular instant of time in the form of pulses. It is like on/off mechanism which prevents the vehicle getting skid. This system stops the vehicle in best possible ways by prevents locking tires of the vehicle. The sensors present near tire sends their data to control unit, control unit analyze the data like the rate of speed so that it can control brakes according to that. The speed sensors monitor the speed of each wheel and determine the acceleration and de-acceleration of the wheels. The valves regulate the air pressure to brakes during Anti-Lock Braking System action. 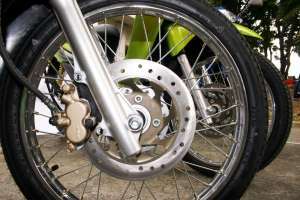 The pump regulates or restores the pressure back to the brakes that have been released by the valves. The information collected my sensors is stored and analyzed by the control unit. A vehicle suddenly veers in front of you, forcing you to brake and swerve. An animal jumps onto the road and you must brake and steer to avoid it. Bad weather makes the roads slippery, making wheel lock more likely when you must brake to stop. If you have any queries regarding this post, let me know in the comment section below.